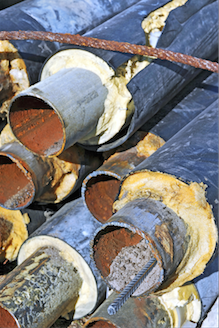 CUI is corrosion that, simply put, occurs under insulated equipment. In more technical terms, CUI is any type of corrosion that occurs due to moisture buildup on the external surface of insulated equipment. While any type of corrosion can occur under insulation the most common types of CUI are galvanic, chloride, acidic, or alkaline corrosion. If untreated, CUI can lead to the shut down a process unit or even an entire facility. The reason it is so widespread, despite being so well-known, is because that by and large, no matter what precautions are taken, water will eventually get into the insulation. According to API 570 there are also specific susceptible temperature ranges under which CUI may occur. For carbon steel piping systems, the range is between 25 and 250°F, particularly where operating temperatures cause frequent or continuous condensation and re-evaporation of atmospheric moisture. Carbon steel piping systems that normally operate in-service above 250°F but that are in intermittent service are also at risk. Inspectioneering's CUI topic page contains links to articles that have been published in Inspectioneering Journal and on Inspectioneering.com with even more information about CUI along with a list of standards and best practices relating to the mechanism. The Inspectioneering LinkedIn Group is a great place for industry professionals to discuss asset integrity topics such as CUI. It's free to join and a great resource for anyone in the industry. API RP 583 is a standard that covers the design, maintenance, inspection, and mitigation practices involving CUI. And finally, I'd recommend that you download a copy of The 101 Essential Elements in a Pressure Equipment Integrity Management Program by John Reynolds. Not only does it cover corrosion under insulation programs, but it also looks at 100 other elements of a world-class mechanical integrity program. Click the button below to download the resource now. Thanks Log in or register to read the rest of this comment.